Table 3095a. P-3m1 (164) space group. Y, X, -Z; -Y, -X, Z; X-Y, -Y, -Z; -X+Y, Y, Z; -X, -X+Y, -Z; X, X-Y, Z.
X, Y, Z; -Y, X-Y, Z; -X+Y, -X, Z; X-Y, X, -Z; -X, -Y, -Z; Y, Y-X, -Z.
k, h, -l; -k, -h, l; h, -h-k, -l; -h, h+k, l; -h-k, k, -l; h+k, -k, l.
Table 3095b. 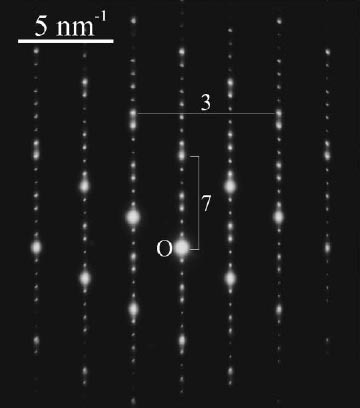 Examples of materials with P-3m1 (164) space group. The intensities of the Nb and Ni atom columns in  direction shows the -Ni-Nb-Nb- ordering. 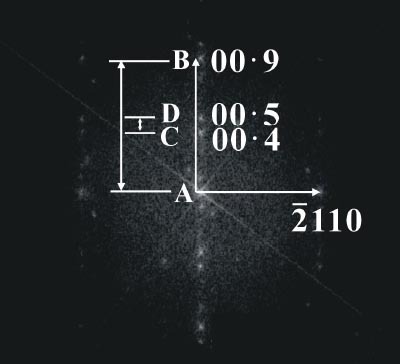 Brightest contrast: Ba (Z=88); brighter contrast: Nb (Z = 73); weak contrast: Ni (Z=46). For [0 1 -1 0] Sb3Te2 in Figure 3095a, the ratio of AB/CD is the layer number (N) in a unit cell. 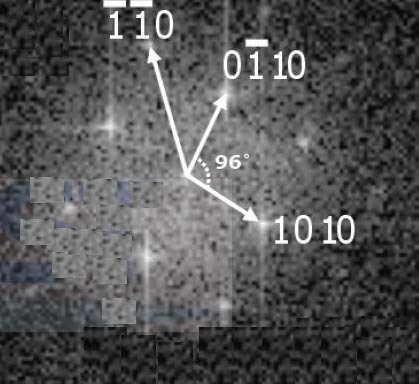 We can know the Sb3Te2 crystal belongs to the P-3m1 space group as N is 9, a multiple of 3. 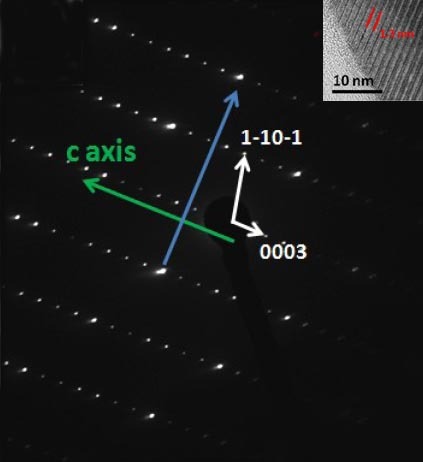 Note that we can index diffraction patterns starting from comparing experimental d-spacings and theoretical calculations obtained from known lattice parameters, for instance, use the excel file for crystals with P-3m1 space group. 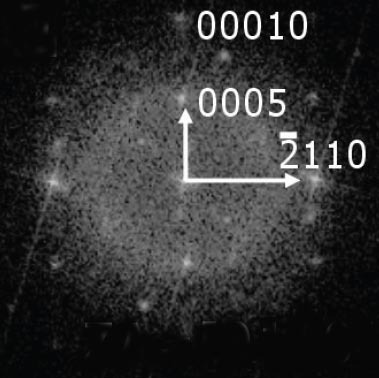 Figure 3095a. 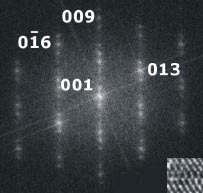 Examples of indexed electron diffraction (or FFT) patterns of 164 (P-3m1) HCP crystals. 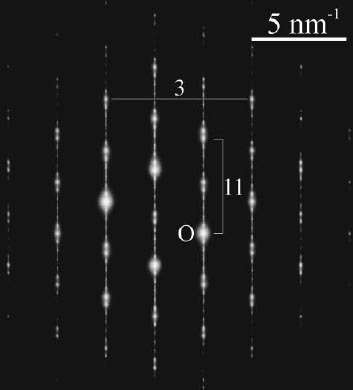 Svitlana Pukas, Liliya Pylypchak, Oksana Matselko, Pavlo Demchenko, Roman Gladyshevskii, MgAl2Ge2 – a new representative of the structure type CaAl2Si2, Chem. Met. Alloys 5 (2012) 59-65. 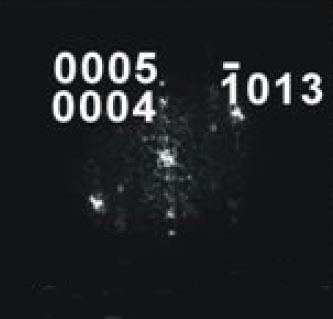 Chad Alan Stoltz, Synthesis of Layered Group IV Nitride Materials by Soft Chemical Anion Metathesis, thesis, 2005. Jungmin Hwang, Magnetoelectric and Multiferroic Properties in Layered 3d Transition Metal Oxides, thesis, 2012. 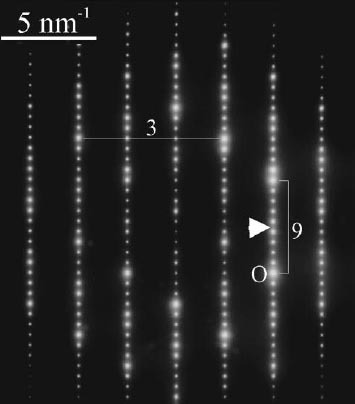 Chang Woo Sun, A Transmission Electron Microscopy Study on the Microstructural Properties of Te-based Chalcogenide Thin Films, Doctoral Thesis, 2010. Enzo Rotunno, Advanced analytical transmission electron microscopy methodologies for the study of the chemical and physical properties of semiconducting nanostructures, Doctoral Thesis, 2014.
) phase change material, J. Appl. 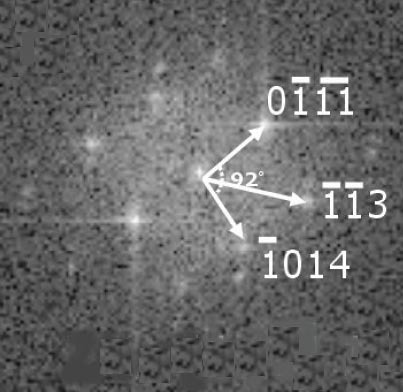 Phys.92 (7), 3584 (2002). 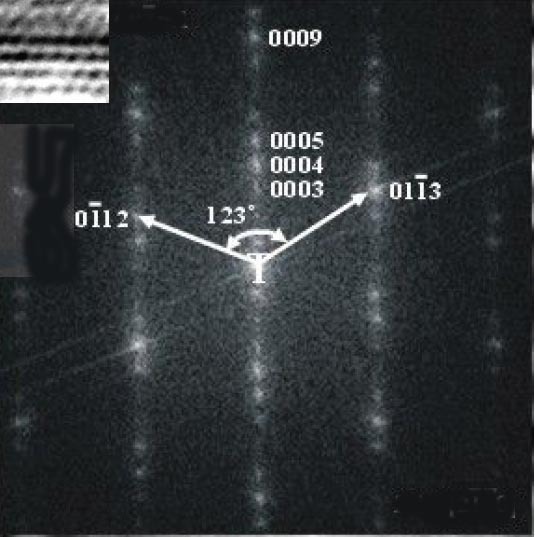 Cheng-Yen Wen & Frans Spaepen, In-situ electron microscopy of the phases of Cu3Si, Philosophical Magazine, 87(35), 5581-5599, 2007.